Help the Ocean Remain Wild & Industry-free! Your tax-deductible annual gifts are an important means of support for Clean Ocean Action's work and go directly to support our programs. You can donate in person, by mail, over the phone (732-872-0111) or online. Monthly giving is now available online. Businesses, big and small, are supporting COA's efforts. See how you can make difference while attracting new customers. 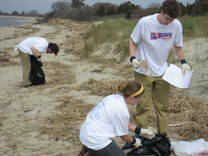 Regardless of your age, please consider naming Clean Ocean Action as a beneficiary in your will or insurance policies. This is an easy step you can take to ensure that your efforts to keep the ocean clean will continue into the future. Contact our development staff notify us of your plans. Make a contribution in memory of a friend or family member's passing or in honor of a birthday, wedding or other celebration. 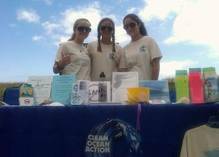 Your company may match your charitable cash donations or even the time you volunteer with Clean Ocean Action. Ask your human resources department for more information. Contact our development staff if you would like to make an in-kind donation! Sign up for the coalition here! These opportunities inform you of critical ocean pollution issues, campaigns, important meetings and hearings, and proposed legislation, and get you involved in taking action for a cleaner and healthier ocean. GET INFORMED. GET INVOLVED. TAKE ACTION. To learn more, feel free to call Clean Ocean Action's office at 732-872-0111.